I generally use heat when removing frets. It's a good way to determine if glue was used during installation and facilitates easier removal. In order to apply the heat only the to frets crown I use a wide tipped soldering iron. I like to file a small notch in the tip so it can seat on the crown without sliding around. In order to pull frets out cleanly, I use a small pair of end nippers that I have filed to flatten the head which rest against the fingerboard. Instead of pulling frets out, I am "pinching" the out. The thin blades of the end nippers slide beneath the crown of the fret and gently wedge them upward as I walk the nippers from one end of the fret to the other, never lifting the pliers but using the wedge effect. Older, brittle boards require patient care as the tang of the frets tends to pull small chips free as the fret is lifted from the slot. When you've re-fretted as many 80 year old fingerboards as I have, it isn't a question as to whether they will chip, it's how badly. Removing the frets correctly means less repair is necessary after removal. Heat can damage and destroy celluloid binding and inlays. It is critical that the irons tip touch nothing but the fret crown. Some of you have witnessed less than professional fret jobs that left the fingerboard littered with chips. While chip out can not always be avoided it can and should be repaired. Amongst my favorite techniques is using some sawdust sanded from the fingerboard mixed with Duco cement. Fills are then block leveled and further fingerboard prepping can begin. With the frets out and the neck adjusted flat it can now be checked for trueness and planed if necessary. To properly plane a neck straight I feel the best sanders to use are close or equal to the length of the fingerboard. Longer planes and sanding blocks cover a greater surface area and make equal removal of material far easier. A radius gauge is an easy way to measure the fingerboard's radius and choose the correct caul for sanding. After planeing, if necessary, I switch to lighter grit sandpaper and a sanding caul that is radiused to match the intended fingerboard radius. A long straightedge is used to ensure the neck is straight and no high/low spots remain. When working on a newer instrument I may use the air hose to blow the sanding dust from the slots. On delicate vintage boards air pressure is enough to blow chips out of the board and is best avoided. A feeler gauge can be used to measure the width of the fingerboard slot and determine the fret tang size needed. While nearly everyone knows that fret wire comes in many different crown sizes (short, tall, wide, skinny) some are unaware that it also comes with different size fret tangs. Using the correct tang size is essential and should not be overlooked. 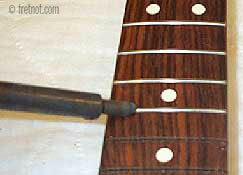 Using a fret tang that is too small for the fret slot can cause frets to quickly loosen and lift. It can also weaken the stiffness of the the neck as the lack of fret slot compression allows the neck to bend more easily. A fret tang that is too large can add too much compression to the neck. When large enough, this can actually back bow the neck as it adds mass to each fret slot... a technique I use to strengthen and straighten older necks with no adjustable truss rod. The fret slots on unbound fingerboards can be cleaned with a traditional fret slotting saw of the appropriate size. Bound necks require very short bladed saws that will fit between the binding or, my favorite, a small hook tool that nicely scrapes the slot clean. To some extent the original radius can be changed if desired. We are however limited by the fingerboards inlays and overall thickness. A drastic change to the radius could require so much wood removal that we endanger the inlays or thin the board. A "compound radius" means the board starts out with a tighter radius at the nut and gently tapers into a flatter radius. A fingerboard with a single radius is shaped the same from the nut to the heel. While we all have our preferences as far as fingerboard radius is concerned I will through out a few tips, but mind you YMMV. Because a tighter radius produces a rounder fingerboard, chord players and those with hand problems may enjoy the tighter radius of 7.25" or 9". The biggest problem with a tight radius occurs when attempting a substantial string bend with average to low action. The string will contact the fret and fret out or buzz. If your a heavy string bender avoid the vintage 7.25" radius or prepare to meet high action. A radius of 16" or flatter may be preferred by those playing lead. These are generalizations of course. How do I know which radius is best for me? Take the instruments that feel most comfortable to you and measure their fingerboard radius. (Or check their specs. online.) If there's a consensus, you've dialed it in. If not, it may not matter much to you. Some fret wire is sold in straight lengths while others come in a coil. Before pressing the fret wire into the prepared fret slots it should be cleaned with Naphtha or similar solvent to remove oil. It is then sent thru a Fret Bender to bend the radius to match the fingerboard. Nickel fret wire wants to "spring" when being pressed into the fret slots and it is usually necessary to slightly over radius it. Stainless steel fret wire is another story. Because it is rigid and retains it's original arch it should be bent to match the fingerboard exactly. For more information on fret wire size and materials, check out my Fret Wire page. When the fingerboard has no binding each fret is cut slightly longer that the fretboard's slot and clipped flush with the fingerboard's edge after installation. Bound fingerboards require far more work. Each fret must have it's tang cut to fit between the binding, leaving the crown to overlay the binding. Once the tang has been cut with fret wire nippers, the remaining bur is filed so the crown can sit flush against the binding. The fret wire's tang is clipped and the remaing bur filed away. An instrument that is subject to low humidity and less than ideal care may also be a candidate for glued in frets. Subjecting an instrument to dry climates can cause shrinking and swelling of the fingerboard which can cause frets to spring free. While this problem is best addressed by taking proper care of the instrument, if it's a known problem glue adds a little insurance. Because I use the compression method I will either be tapping the frets in with a fretting hammer or pressing them in with a arbor press. To avoid dinging the new fret when installing them I use a fretting hammer with a plastic tip. 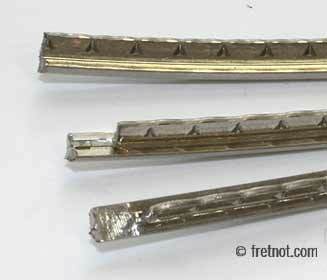 The arbor press is equipped with "feet" which are machined from brass and are shaped to match the fingerboard's radius. With the fret sitting atop the slot the arbor press pushes the fret into the slot. Frets are slightly beveled on the edge.. Manufacturers vary a bit on how they bevel and round the fret ends, but the object is the same....no sharp edges! Can someone over bevel the fret ends? Yes! In severe cases the outer E strings may lie over or terribly close to this bevel and cause the string to roll off the frets edge when playing. With the new frets installed, filed flush with the fingerboards edge and properly beveled we can move onto leveling, re-crowning and polishing them. When tension is placed on the neck it is normal to see some amount of relief or upward bow. When the relief becomes excessive we tighten the truss rod to counteract it and draw the neck straight again. What if the guitar has no adjustable truss rod? 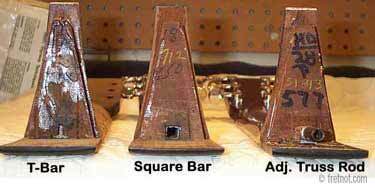 While most instruments built after the turn of the century do indeed have a truss rod, not all of them are adjustable. Some of these necks merely use a rod or hardwood inlay to stiffen the neck. The T-Bar and Square Bar strengthen the neck but are not adjustable. When an instrument without an adjustable truss rod suffers from too much relief or a permanently bowed neck, planeing and refretting can often improve it's playability. Even after planeing a neck flat it may still bow a considerable amount under tension if the neck is weak. In an effort to stiffen it, fret wire with oversized fret tangs can be used for additional compression. Because this is just as much experience as it is technique, the correct size tang must be chosen to insure the neck does not end up back bowed. There are necks that I can flex with my hands, some can actually see them flexing while playing. While planeing and refretting on of these may improve them somewhat it can be a risky adventure. A neck that shows itself to be weak in this manner is not likely to undergo a radical transformation simple because it has been re-fretted with oversized tangs. Careful examination is in order here, as well as an up front, honest conversation with the owner. Putting money into a refret when the neck is in serious trouble can be hopeful thinking. When these instruments were manufactured the board was fretted, the frets where filed even with the edge of the board and then the binding was attached. The binding, which sits proud of the fingerboard is then scraped level with the fingerboard leaving the small nub of binding at the end of each fret. Many like the feature as it prevents strings from catching under the ends of the frets when they are rolled off the edge of the fingerboards (which can certainly be prevented without them BTW). When refretting an instrument fretted in this manner, those nubs disappear while sanding the fingerboard. It is unavoidable when the entire fingerboard is being re-fretted as the fingerboard must be resurfaced to prepare for the new frets. Bar frets differ from traditional fret wire in that the crown and tang are exactly the same size, unlike the mushroom shape of today's wire. 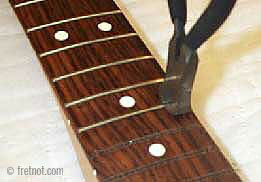 Traditional fret wire can not be used to refret an instrument that has bar frets due to their size. Today's fret wire tang is not large enough to fill the fret slot of a fingerboard who originally had bar frets. Sources for bar fret wire pop up from time to time but I no longer have it in stock and do not offer it. You can see picture's of a bar fret refret here. Partial refret - When we replace only a few of the first position frets. When more than 7 frets need replacement a total refret is usually in order to permit resurfacing of the fingerboard. Complete refret - Obviously considerable fret wear requires a complete refret, however, it is also necessary when the fingerboard must be planed to correct neck issues. Bound Fingerboard - Binding is a decorative strip of plastic or wood which caps the edge of the fingerboard. 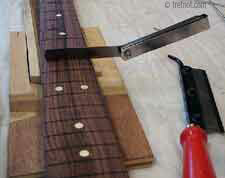 Refretting a bound fingerboard is more time consuming as the fret tangs must be cut to fit precisely within the binding. Fret tangs are not visible on bound fingerboards. Unbound Fingerboard - When looking at the side of the instruments neck the fret's tang is usually visible, some are undetectable when dark or thick finish covers the fingerboard's sides. 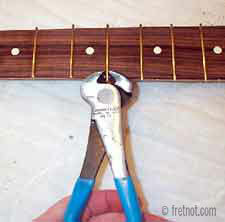 Fret Crown - The fret crown is the portion of the fret which comes in contact with the string when fretted. Fret wire is available with different fret crown widths and heights. 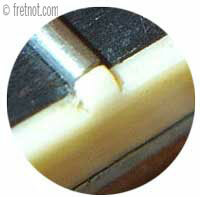 Fret Tang - The barbed portion of a fret that is pressed into the fingerboard to hold the fret in place. Fingerboard Radius - The curvature of the fingerboard.